I temporarily lost my Thunderbird email account and spent most of my day trying to retrieve it. which I finally, finally did after many failed attempts and much frustration. Since we honor the memory of Dr Martin Luther King, Jr today, I wanted to post my own memorial, but the day is nearly past. 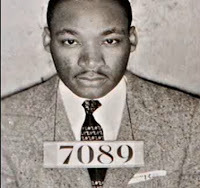 I was going to voice a reminder that Dr King's courage and strength in the struggle for justice and equality for African-Americans was rooted and grounded in his Christian faith and in his reverence for the Hebrew and Christian scriptures. A friend posted the following link to an article in Salon on his blog which I share here. Please do not be put off by "macroethcs" in the title. I learned much from the article of Dr King's suffering during the struggle and about what kept him going. It's well worth a read. Thanks to Rmj at Adventus for the link. 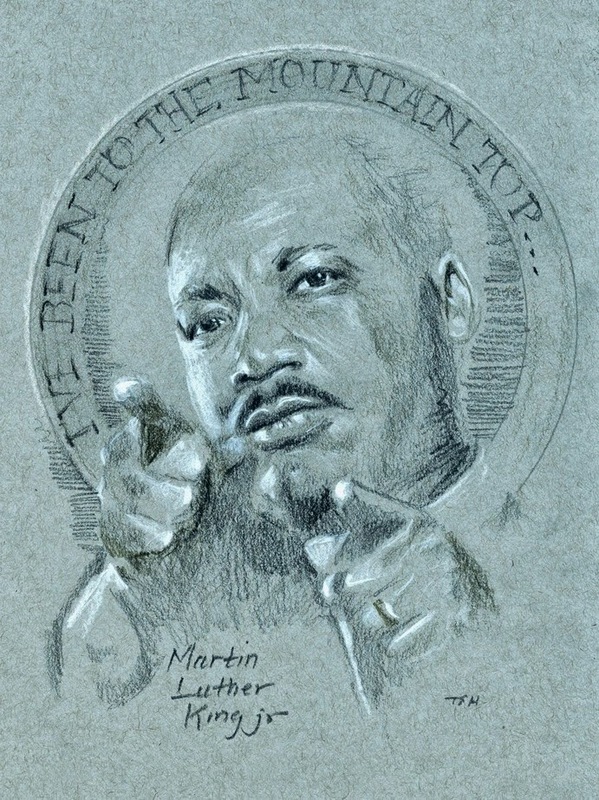 Icon of Dr King by Tobias Haller. Today I'm sad that racism is still such a presence in our society. 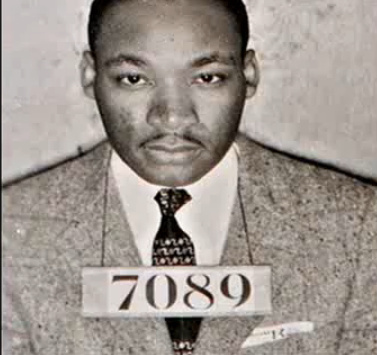 What would Dr King think if he looked around today? I expect he'd be sad, too. Though voters elected President Obama twice, the presence of an African-American in the Oval Office seems to have forced racism from the dark crevices and corners where it always lurked into the light of day in a way that surprised many of us. I don't know what else to say, for the few words I've written came very hard. 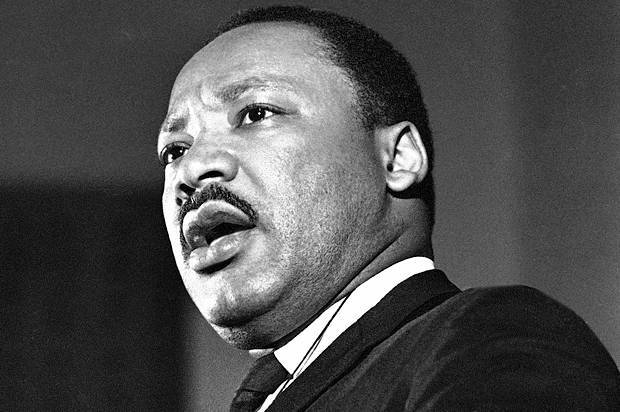 Excerpts from Martin Luther King, Jr's response to a letter from fellow clergy who opposed the civil rights protests, suggesting that the actions were "unwise and untimely". 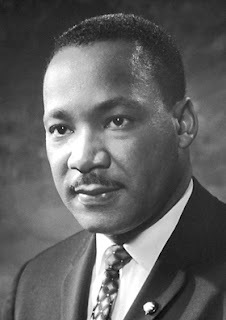 Martin Luther King, Jr's letter was written in response to a letter from eight fellow clergymen. The link to the letter from the clergy is on Standford University's site, from which I took the quotes from MLK's letter. Which of you who has a friend will go to him at midnight and say to him, "Friend, lend me three loaves; for a friend of mine has arrived on a journey, and I have nothing to set before him"? Although this parable is concerned with the power of persistent prayer, it may also serve as a basis for our thought concerning many contemporary problems and the role of the church in grappling with them. It is midnight in the parable; it is also midnight in our world, and the darkness is so deep that we can hardly see which way to turn. It is also midnight within the moral order. At midnight colours lose their distinctiveness and become a sullen shade of grey. Moral principles have lost their distinctiveness. For modern man, absolute right and wrong are a matter of what the majority is doing. Right and wrong are relative to likes and dislikes and the customs of a particular community. We have unconsciously applied Einstein's theory of relativity, which properly described the physical universe, to the moral and ethical realm. The traveller asks for three loaves of bread. He wants the bread of faith. In a generation of so many colossal disappointments, men have lost faith in God, faith in man, and faith in the future. Many feel as did William Wilberforce, who in 1801 said, "I dare not marry---for the future is so unsettled," or as did William Pitt, who in 1806 said, "There is scarcely anything round us but ruin and despair." In the midst of staggering disillusionment, many cry for the bread of faith. But even in the inevitable moments when all seems hopeless, men know that without hope they cannot really live, and in agonizing desperation they cry for the bread of hope. And there is the deep longing for the bread of love. Everybody wishes to love and be loved. He who feels that he is not loved feels that he does not count. Much has happened in the modern world to make men feel that they do not belong. Living in a world which has become oppressively impersonal, many of us have come to feel that we are little more than numbers. Millions of Africans, patiently knocking on the door of the Christian church where they seek the bread of social justice, have either been altogether ignored or told to wait until later, which almost always means never. In the terrible midnight of war men have knocked on the door of the church to ask for the bread of peace, but the church has often disappointed them. What more pathetically reveals the irrelevancy of the church in present-day world affairs than its witness regarding war? And those who have gone to the church to seek the bread of economic justice have been left in the frustrating midnight of economic privation. In many instances the church has so aligned itself with the privileged classes and so defended the status quo that it has been unwilling to answer the knock at midnight. 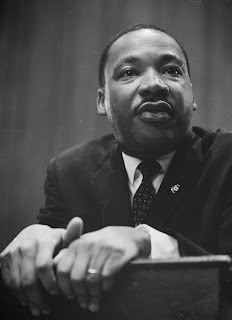 Choosing excerpts from MLK's sermons and speeches is difficult, and my post, of necessity, runs long. With adjustments of references to the situation in the present day, the Rev King's words appear cutting edge, though the sermon was delivered on June 11, 1967.